I’m quite a fan of beef wellington. If on the menu, for sure I will choose it, in any restaurant. But it’s not an easy dish to get right. Mainly because of the beef because you need to get the meat just right otherwise it will be ruined. So I decided to try individual portions: mini beef wellington 🙂 I find that it’s easier to cook. And when I try a bigger version, I have to slice it to be able to divide between the plates. I find that it ruins the whole design of the dish. By doing smaller versions, each person gets one and it looks better. Place a frying pan to heat up. When hot, add 2 tbsp of olive oil. Let it warm up. Place the meat tenderloins in olive oil and sear the meat so it forms a crust on all sides. Remove and coat the meat with the mustard. Allow to cool. Grind the mushrooms until it forms a paste. Place the mushroom paste in a frying pan to dry. When all the moisture evaporates, remove from pan and let it cool. Roll out some cling film on the kitchen top. On top, form a bed with the slices of Parma ham, overlapping the strips. Spread the mushrooms paste on top of the ham. Repeat 3 times more to obtain 4 Parma ham and mushroom beds. Finally, place 1 piece of meat on each bed. Wrap with the help of cling film. Form a kind of chourico, close the ends and place in the fridge for 30 min. Again roll out some cling film at the kitchen top and roll over the puff pastry cut into 4 equal squares. 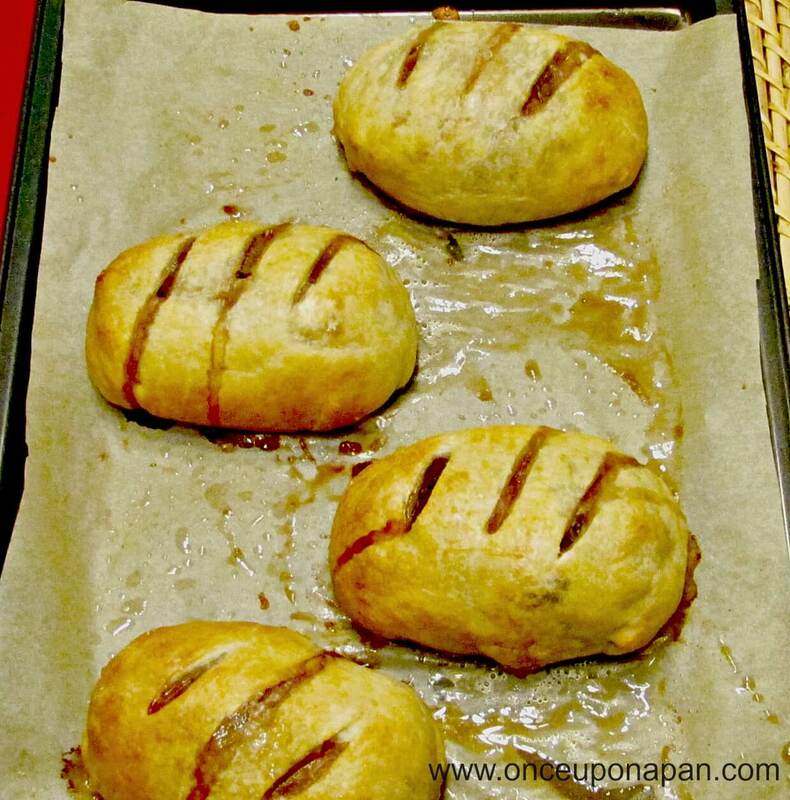 Remove the meat from the cling film and place 1 piece on top of each piece of the pastry. Brush the edges with egg yolks beaten in a little water. Close the pastry squares and seal well. Wrap in cling film and place in the fridge for 15 min. Remove the film and place the wellingtons in a baking tray lined with baking paper. Brush the wellingtons with the beaten egg yolks and sprinkle with salt. Make some cuts on top to let out the steam and bake for about 30 min.